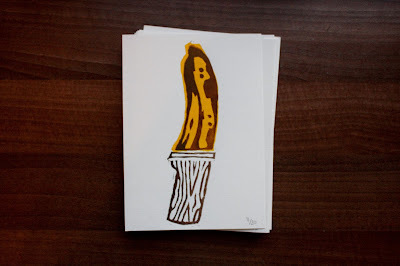 Recently, I created some lino cut 'Banana Knife' prints as part of one of my primary experiments for the 'Design for Print' module. The print experiment was created with a concept as I didn't want to create a useless piece of work, therefore I designed the 'Banana Knife' with the intent that the outcomes would be sent to the London based charity art against knives. I first heard about 'Art Against Knives' last year when I entered into a Talenthouse design competition that the charity annually head. While producing my outcome for the competition I researched into the charity and reviewed their story, the 'Art Against Knives' team regularly work with 'at-risk' children aiming to secure them education and employment. Its a message that I am more than happy to support, ethical practice forms one of the corner stones of my design practice and therefore creating the prints not only benefits the charity but also me. I was asked to send images of the prints so they could see if they were relevant for sale on their online shop. Finally, I received the email confirming that they wanted the prints and also provided me with their address. The prints will be sold on this website when they arrive in London. After receiving the conformation email I produced a set of twenty prints on thick 190-gsm water colour paper, I then numbered the prints and signed the bottom left hand corner. Finally, I purchased some padded A5 envelopes to protect the prints in the post, for extra protection I also cut an A5 sheet of grey mount board to keep the envelope rigid.